In the Philippines, solar panels and other solar home systems are rising in demand because more and more Filipinos are now realizing the value in becoming environmentally conscious. Choosing to live green has positive impact on the environment long-term, but there are immediate benefits in our life anyway. Wondering how going green and living a sustainable life will affect you? 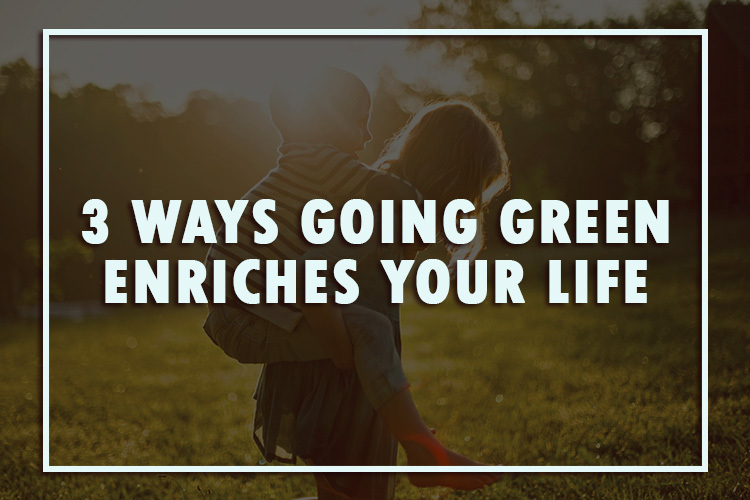 Continue reading this article and find out just a few of the many ways on how going green can enrich your life. Many people think that going green will cost huge amount of money. On the contrary, choosing to go green will enable you to live simple and frugal life. This could help you save a lot of money in the long run. One example is by ditching your expensive chemical products. When you get rid of the chemical products that you commonly use, you can make your own natural product—whether it is home cleaner, culinary spices, or beauty products. Another example is having solar panel installed on your roof. Yes, solar panels may seem costly at first, but there are many affordable solar panels available in the metro. Once you install solar panels at your home, you can reduce your dependency in electricity, which allows you to save in electricity bills in the long run. Did you know that going green can improve your mental health too? Since adopting a sustainable lifestyle means living with less and avoiding unnecessary consumption, the absence of unnecessary material things in your life will definitely enhance your mood and the ambience of your home. The clutter in your home directly affects your mood and blocks your clarity. Decluttering your house will result in a clean home and a peaceful mind. One of the simplest ways to go green is to eat healthy and locally-produced food. Opting for organic products will certainly help you stay away from the different toxic and chemically produced food being sold in the market. Such kind of processed food often possess different harmful ingredients that are dangerous to your health. By eating only organic food, you spare yourself and your family of toxic chemicals such as artificial ingredients and pesticides. You’ll feel healthy, and look healthy! Going green is a way of life that’s slowly making its way back in our society. It’s all thanks to the undying campaign and initiative of several environment groups not only in the country but around the globe as well. Simple habits, such as composting, conserving water, and consuming less energy are some of the easy ways to start going green in your home.